This church is often called simply the Chesme Church. It’s situated in Lensovet Street not far away from Mos­cow Square and Moscow Prospect. Near the church there is a palace of Catherine II named the Chesme Palace. The palace was built as a place where Catherine the Great could stop for a rest on her way from St Petersburg to her country residences. The palace and the church got their names in com­memoration of the victory of the Russian fleet over the Turkish fleet at Chesme Bay. This battle took place in the Aegean Sea in June 1770 after the Osman Empire declared war to Russia. The Osman Empire had the intent of seizing Trans­caucasia, the Northern Caucasus and the Ukraine. The war lasted from 1768 till 1774. The battle of Chesme was one of the most outstanding and heroic events of the Russian-Turkish War. At that June night 14 Turk­ish battleships, 6 frigates and about 50 other warships were burnt, 6 warships were captured. In the battle fatal casualties of the Turkish army were about 10 thousand people. Fatal casualties of the Russian army were 11 people. The Chesme Church was constructed between 1777 and 1780. The famous architect Yury Felten designed this church. The architect Yury Felten is well known for his remarkable architectural works, such as the railing of the Summer Garden and the Old Hermitage. 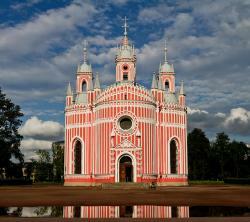 The graceful Chesme Church is one of the rare pseudo-Gothic struc­tures in St Petersburg. The building of the church consists of four half-cylin­drical parts joined together. The building of the church is decorated with narrow buttresses and tall windows. The walls are finished with a jagged parapet. The church has five domes. The drums of the domes are em­bellished with elegant turrets. The domes are crowned with small spires and crosses. The most part of the 20th century the services weren’t held in the church. In 1977 the building was restored and the exposition was opened there. It was devoted to the victory at Chesme Bay. On display there were documents, maps, models of men-of-war, 18th century naval instru­ments, the Russian and Turkish flags, weapons, medals and portraits of outstanding Russian naval commanders. At the end of the 20th century all the museum exhibits were brought to the Central Navy Museum. Nowadays, the services are held in the church. On the church territory there is a small military ceme­tery. The veterans of the Russian army are buried there. Among them there are some graves of the defenders of Leningrad. They were buried there during the Second World War.